The Large Hadron Collider is running better than ever this week with record peak luminosities of 7.2/nb/s and a record-shattering 0.3/fb delivered in the last 24 hours. After they reached the 10/fb total luminosity milestone for 2012 a couple of weeks ago they undertook some messing about that included a polarity switch for ALICE. One outcome of all that was that CMS accidentally lost its solenoid for a few days which gave them an opportunity to do some more tests in the shadow. I am not sure of all the details but there seem to have been some collimator changes and the end result is that everything is now running much better so they should be able to make up the lost time. If anyone has a better description of what went on please do let us know. A couple of days ago there was also a Machine Advisory Committee Meeting to report on where they go next. There is a new schedule with a few changes. It looks like they want studies for running after the long shutdown as a priority, and are making the case that enough luminosity has been delivered already. I think they still need to get as much as they can to help resolve the Higgs cross-section anomalies. A good compromise would be to attempt 25ns run after the next technical stop with a smaller beta*. Without a webcast of the MAC talks it is hard to tell where they are really heading but they seem to be planning for at least some more 25ns development runs. 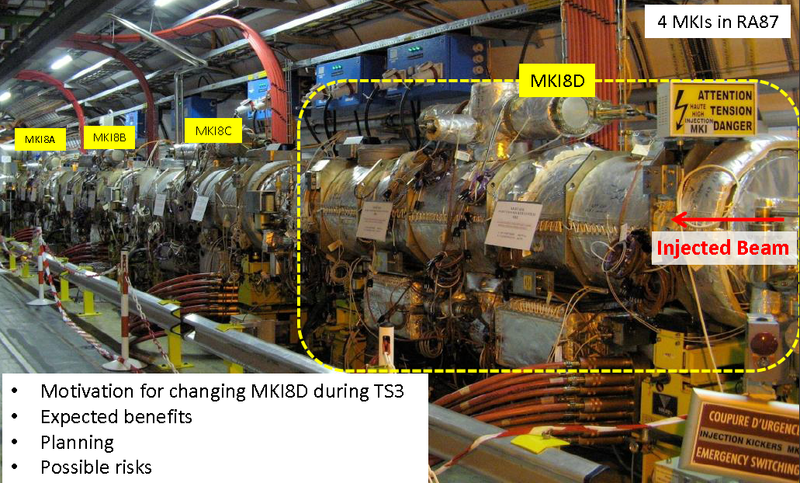 Another thing they are thinking about is replacing the injection kicker (MKI8) that has been suffering from overheating since luminosities peaked earlier this year. This has been forcing them to delay some fills while it cools down. The change would be risky and could result in lost time, but if they can test out the replacement before the long shutdown it would put them in a better position when they restart at higher energy in 2015. It looks like a big job though. This entry was posted on Saturday, August 18th, 2012 at 2:42 pm and is filed under Large Hadron Collider. You can follow any responses to this entry through the RSS 2.0 feed. Both comments and pings are currently closed. to understand that the Universe is a holographic state on a fundamental frequency og a meter wavelength of light. I nominate this as unintentionally funniest vixra log comment for 2012.
thanks Ben but did you see my website ? You might even say that physics is even more funny after reading some truths there. Actually Physics is so funny that children love to hear the once upon a times story where the wicked fairy Einstein waved his wand and ‘NO NEED FOR EMPTY SPACE ANY MORE FOR YOU NOW HAVE MY GEODESICS> THEY ARE EVEN MORE EMPTY HA HA HA . See http://www.kapillavastu.com/index.html?r=20120724134234 for the slides PPT. They make it clear that their intention is to continue running at 50ns for the rest of 2012, with 25ns operation during the MDs on Oct 8-12, 15. From this, they want to extrapolate the data for ecloud and duration of scrubbing runs for 7Tev. I am sure that you are right about the base plan. Perhaps I am reading too much between the lines when Myers asks “What is enough?” It seems to suggest that he would like to make 25ns studies a higher priority than collecting more luminosity for the final run. A few scrubbing runs and MDs will not allow them to push the bunch numbers up to see what really happens at nominal running conditions. Knowing that before LS1 would be very useful, but the case for as much luminosity as possible is also a good one and 25ns is likely to result in less of it. When do experimentalists expect to have fairly definitive evidence on the spin of the recently discovered boson? Is there a simple explanation for why the bunch spacing has to be 25 ns rather than 50 ns for 13 or 14 TeV operation? At the higher energy they will be able to use a smaller beta* for the squeeze and that could soon result in luminosity increases by a factor of 5 or more. The experiments will then have to face even more pileup and that could become too difficult to cope with. At 25ns the collisions are spread over twice as many bunch crossings so for the same luminosity the pileup is half as much (provided events from one crossing do not affect the next). That is the main reason to go to 25ns. 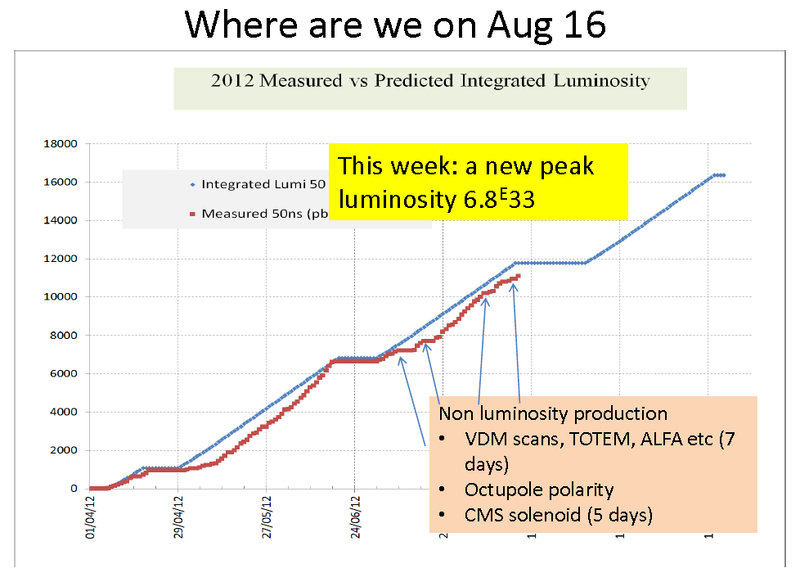 The benefit for LHCb will be even better than ATLAS/CMS because LHCb are using luminosity leveling to reduce pileup already. For them the move to 25ns should double their luminosity. If I used any terms you are not familiar with and can’t look up, just ask me about them. Philip, nice update. I think there is mistake in stating ALICE magnet reversal was cause of CMS solenoid problem. It was actually brought forward exactly because of CMS problem and they decided to flip ALICE polarity. Before, it was scheduled after next TS, see slide 26 of Steve Myers on MAC, in new schedule this flip is gone. I actually dont know if they know cause of CMS magnet heating there was something about communication or power problem. The pileup argument is of course important one, although i think experiments can handle it. Actually 50 ns is still in the game even for 12.5-13 TeV run, its question if LHC reaches 14 TeV, maybe after LS2, retraining the magnets for 7 TeV beam field woul take too long. For details see Mike Lamont closing talk slides 30-31. During MAC almost all teams said they need more data for 25 ns to extrapolate to 6-7 TeV beam region. For current state, again injectors are the key, even after TS1 situation got better when they got better beams from injectors. Problem for LHC with over nominal intensities is margin in chromacity and tune, which is small. They are at limits juggling with the values all the time. I would also said there is some kind of memory effect in the machine. You seem well informed, are you connected with the running of the LHC? Any idea why the losses on beam 2 are consistently worst compared to beam 1? carla, i am not connected with CERN, fortunatelly we have advantage of incredibly opened information and reports from LHC. Stephen, i think, H9 refers to certain injection/bunch splitting in PS/SPS injector chain. “Plastic ageing” refers to radiation ageing/demage in scintilator material in LHCb hadronic calorimeter. Yeah Philip, LHC broke to new grounds with 1.65e11 ppb and 7.7e33 lumi record althought there are clear loses on last fills when going to collisions. I dont know what the H9 MD or plastic ageing are about but there is a new article in the CERN bulletin that confirms some of the news I reported. Looks like they are finally back on track, CMS solenoid is working again and intensities are up, but only three weeks left before the next technical stop. I have the impression that in the p-p collision that the jets are from left to right. Is it designed to do that? If both protons are at the same speed should there be 50% chance of the jet going right to left?